“This isn’t meant to be a confession. Not in any spiritual sense of the word. Yes, I’m in jail at the moment. I imagine I’ll be here for a long time, considering. But I’m not writing this down for absolution and I’m not seeking forgiveness, not even from myself. Because I’m not sorry for what I did to Rose. I’m just not. Not for any of it.”Ben Gibson is many things, but he’s not sorry and he’s not a liar. He will tell you exactly how what started as a simple school camping trip in the mountains ended the way it did. About who lived and who died. About who killed and who had the best of intentions. And he’ll tell you about Rose. But he’s going to tell you in his own time. Because after what happened on that mountain, time is the one thing he has plenty of. Wow, just...wow! This book went FAR beyond my expectations! I had no idea that a story of this magnitude was hidden inside of these pages. 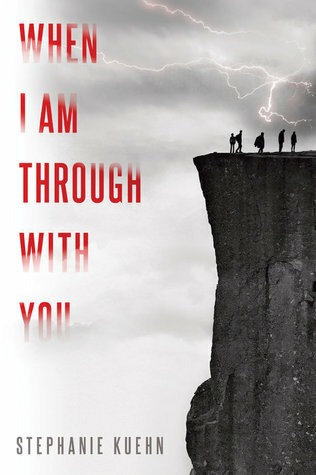 WHEN I AM THROUGH WITH YOU tells the story from Ben Gibson's perspective. Ben is your average teenage boy. There is nothing extraordinary about him. He is not popular but he is not unpopular. He is just normal. But far from normal are the events that take place on this camping trip. WHEN I AM THROUGH WITH YOU will take you down its rabbit hole. Sucking you and not letting you go. Stephanie Kuehn delivered this compelling novel effortlessly. She is the very definition of a story-teller. She took these characters and crafted an outstanding, wild and horrific tale. Each chapter ending on a note that led you further into the darkness alongside the characters. However, this book is more than just a camping story gone wrong. It is filled with so much more. As we learn the backstory of Ben and the other characters, the book becomes a voice for child abuse, neglect, and addiction. It's been a while since I've read a book that has had me so enthralled! This is the perfect book to add to your summer reading! And, if you're a gluten for punishment, it's perfect for those nights camping by the fire. I simply cannot wait to see what else Stephanie Kuehn has up her marvelous sleeves! Glad you loved this one too!! It is one of my faves of the summer so far. I loved how she mixed the setting with the character's inner darkness. I thought it worked out perfectly. Great review!